Feel on top of the world in beautiful San Gabriel Valley where the 710/10 freeway's meet, Luminarias restaurant shines brightly on the hilliside of Monterey Park with striking views, a tropical atmosphere, glamorous event spaces, unrivaled service, traditional Mexican dining and all-inclusive planning. Whether you’re celebrating a milestone or planning a business event, we welcome you to Luminarias. Our experienced special events team is dedicated to making your next corporate event, wedding reception, quinceñera, social gathering or private party unforgettable. Enjoy the peace of mind of having your event handled exclusively by an events manager who truly cares about your celebration. 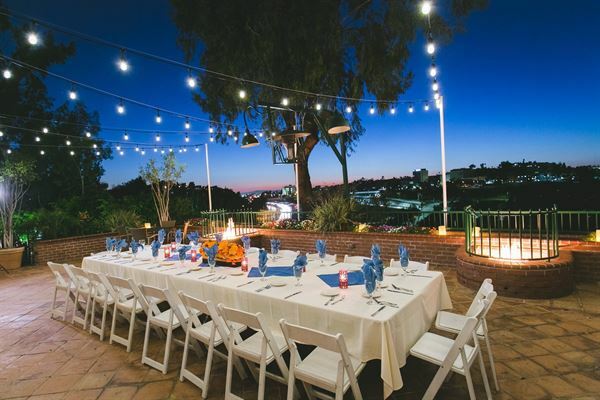 With years of experience, Luminarias' special events team is well-connected with local vendors and the community, so we can create the event of your dreams. Let our expert event team design, coordinate and execute your occasion flawlessly. Available year-round, our eight outdoor and indoor event spaces accommodate 25-500 guests. Additionally, most of our spaces boast views of the surrounding valley. With an expansive event space, we can accommodate groups of various sizes and work well within with your budget. 6 hour Dinner event Prices subject to service charge and current sales tax Butler passed hors d’oeuvres Select three – 6 PC. PER PERSON Chicken sate with peanut sauce, classic Swedish meatball, Honey glazed chicken wrapped in bacon, vegetable spring roll, fruit skewer Plated salad SELECT ONE Organic winter mixed greens Red onions, dried cranberries, pumpkin seeds, raspberry vinaigrette Caesar salad Aged parmesan, croutons, Caesar dressing PLATED ENTRÉE 40 SELECT TWO VEGETABLE PASTA PRIMEAVERA LEMON PEPPER chicken LUMINARIAS CHICKEN SALMON FIESTA Roasted turkey breast BEEF POT ROAST TEQUILA STEAK PEPPER CRUSTED PRIME RIB FILET MIGNON – MARKET PRICE PRIVATE Buffet 45 ONE SALADS, SELECT TWO ENTREES Accompaniments GARLIC MASHED POTATO, SEASONAL VEGETABLE, WARM ROLLS AND BUTTER Coffee, tea, iced tea & water service Holiday decadent plated dessert Table linen and napkins AVAILABLE IN HOLIDAY COLORS Upgrades are available, please see attached PDF for more details.